It is a sad picture, and one that carries a surprising anxiety. The small house is surrounded by chain link fencing, topped with barbed wire, a ‘beware of dog’ sign bars the door, and nearby another hand-scrawled posting advises that the house and lot are not for sale. It is a tiny fortress, buttressed against a panic driven transformation of the urban landscape – last chance to buy, last chance to save the house, last chance to escape – it is hard to tell which is more important – but it is definitely the last chance. The picture carries an uncanny stillness. Its rigid frontality compresses its spatial depth; its high contrast reduces the volume of the buildings and further flattens the space; a black and white, minimalist palette draws the mind away from the reality of the streetscape and renders each element in an emblematic mode. Depth is severely reduced so that the eye is left to wander across an impossibly complex surface whose textures seem brittle and harsh. The sky is almost non-existent as if to withdraw from the natural world, to exclude and reduce its presence, we look for a familiar landmark but there is nothing. The perspective is low, close to the street-level, and yet entirely without footing. We are left with a sense that this scene is out-of-time, not timeless in the eternal sense, but withdrawn from the specificity of the moment of its taking – we are left to wonder if it is a construction, a fabrication, a collage of impossible incongruity. In much of Eric Deis’ recent work we can witness a strong interest in producing photographs that capture heterogeneous spatial configurations within the city. Several of his recent photographs focus on the juxtaposition of dissimilar buildings as seen in Last Chance. 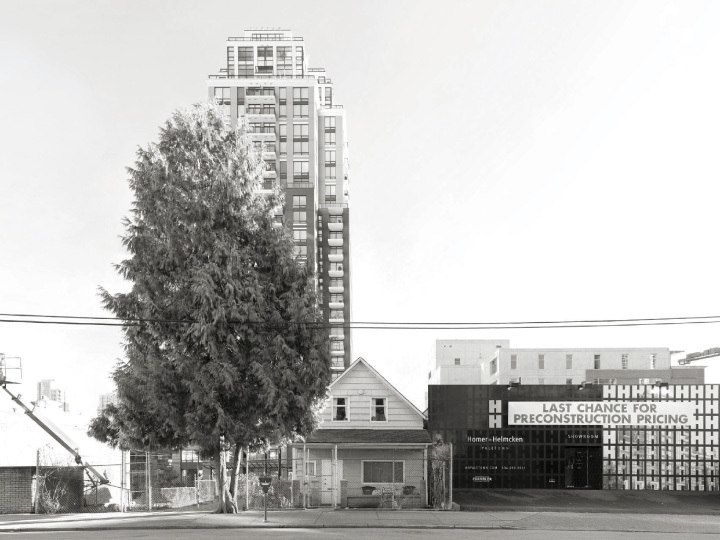 These photographs, shot in Vancouver, Tokyo, Toronto and elsewhere have a shared compositional and technical methodology, and a common interest in the strategies used in the public and private redevelopment of urban spaces. Tokyo is famous for the complexity of its urban growth in the post-WWII reconstruction of the city. The density of the city’s population, the explosion of post-war building, and arcane zoning bylaws makes for complex urban spaces. This is most telling in those areas where multiple land uses are present. Deis’ Rose Marry, 2008 offers a memorable image of Tokyo. On one side is an elevated railway, the JR Line that circles the inner core of Tokyo and provides connections to all parts of the country. Jammed into the space beneath the elevated platform, the small shops are closed for the night, but their presence is strategic to the densification of the city, offering daytime commuters a place for a quick meal or small errand. Across the street the brightly lit sign for a game arcade advertises four floors of entertainment, and further down the seemingly endless street more food and entertainment are offered. People walk up and down the street alone or in groups. Significantly, like many places in Tokyo there is no clear demarcation as to whether this is a pedestrian thoroughfare or a vehicle roadway, and of course, it is both, without being either. The composition is simple, a long central axis is flanked by the heterogeneous streetscape on either side, receding into the density of the city. The absurd complexity of the lighting is perhaps the key to the scene (and the city as a whole) for here neon, incandescent and fluorescent lighting punctuate the night, casting incongruous and yet revealing light along the way. Unless you know this area of Tokyo (or the many places like it) you may wonder at the improbable mixture of land uses and the density of the built environment. It is a picture that is simultaneously arresting for the complexity of its content, the extraordinary detail of its rendering, and the disarming simplicity of its composition. Deis’ Hipsters and Drug Dealer, 2006 offers a similarly complex night scene, situated in Vancouver at a vantage point high above the city’s east side. An unnaturally bright night sky casts a mauve glow across the building, while streetlights and building lights punctuate the scene with an unflinching clarity, revealing multifarious interactions that comprise life in this neighbourhood. In the dark distance we see the skeleton of the old Woodward’s building, a bombed-out shell absorbing the light around it like a black hole in the night sky. For many generations that building could be identified by its big ‘W’ sign that stood as a beacon in the city. In recent years a public campaign was mounted to save some aspects of the old Woodward’s store while allowing for a redevelopment of that vital site in the downtown eastside. In Deis’ image the ‘W’ beacon is gone and the building site is dark. The light now emanates from everywhere but the Woodwards site. In the foreground of the picture a small group of people gather at the edge of an alleyway. Across the alley, a lone figure stands quietly; these are undoubtedly the hipsters and drug dealer of the title, but they stand for so much more, for the mixed and multifarious uses of the neighbourhood and for blurring and blending of cultures and economies. Deis’ overhead position offers an insight into the nature of the change that is settling on this poor and challenged neighbourhood. For many, the Woodward’s development is seen as an exemplary instance of urban densification combined with a strategic mixed-use design that will see it serve the needs of the many and diverse citizens of that area. Today, educational, cultural, non-profit and governmental tenants occupy the site, along with non-market and market housing, commercial businesses and day-care facilities. Deis’ photograph invites us to consider the nature of the change that has come to this area. While the Woodward’s site will undoubtedly contribute to the positive evolution of the area, one can’t but wonder how long the surrounding streetscape will survive the wave of gentrification that is sweeping through the city’s eastside. It seems likely that Woodward’s may very well be the black hole that Deis describes, drawing the neighbourhood’s diversity toward it like the gravity of a collapsing star, compressing and condensing its diversity into a single city block, while the surrounding streets settle into a banal, market-determined homogeneity. It is this interest in capturing the city’s complex spatiality that is the subject of much of Deis’ work of the past five years. Both the Tokyo and Vancouver pictures give priority to the representation of urban spatiality and the forces that produce it. For the most part Deis’ images emerge from his observation of the city as a site to be traversed and studied. While much depends on the angle of view, the time of day, or the opportunity, it is clear that the city is a space that is shaped and formed by a variety of fundamental forces. In this sense Deis enacts Charles Baudelaire’s notion of the flâneur, an artist who has an important role in understanding and portraying the city. The flâneur is an observer who declares an objectivity, detachment and criticality in the face of the city’s spectacle. While the flâneur’s claims to autonomy, objectivity, and cynicism may be open to some debate, there remains an opportunity to characterize a process of critical observation and representation that is produced in this type of engagement with the city. Hipsters and Drug Dealer, Rose Marry and Last Chance, are most certainly the work of a flâneur, for they are in part the product of a moment of chance encounter, one that cannot be returned to or reconstructed, and in this sense they can only be captured by a flâneur who wanders the city seeking out the necessary point of view and moment of observation that reveals the city for what it is, a construct that is constantly evolving, reconfiguring itself according to a multitude of social, economic and political needs and forces. Baudelaire’s short prose poem, ‘The Eyes of the Poor,’ posthumously published in the collection Paris Spleen (Le spleen de Paris) comments upon the changes taking place in mid-19th century Paris. Baron Georges-Eugène Haussmann’s reconstruction was well underway when Baudelaire crafted his observations on the clash of cultures that it produced. ‘The Eyes of the Poor,’ as the title suggests, describes a moment when the author and his lover sat down at a new café that was built on one of the great new boulevards. He describes the brightness, beauty and wealth of the new café that shines and glistens with light, gold and mirrors. A destitute father and two children observe the café from the street, wondering, for diverse reasons, about its wealth and opulence. The author describes his embarrassment in the recognition that “…I was even a little ashamed of our glasses and decanters, too big for our thirst.” But his shame turns to anger when his lover, declares that, “These people are insufferable with their great saucer eyes. Can’t you tell the proprietor to send they away?” One can easily encounter a similar scene in Vancouver’s Downtown Eastside and the other nearby, transitional areas that surround it such as Chinatown, Yaletown, Southeast False Creek or False Creek Flats. These are areas that are undergoing a highly rationalized, large-scale transformation in which residential, commercial, recreational and institutional zones are brought into a determined configuration. While one could point to many differences between 19th century Paris and 21st century Vancouver it sometimes seems to be only a matter of degrees. Vancouver’s call for densification, sustainability and, to a lesser degree, mixed- or non-market housing are part of a massive movement to reconfigure the city’s central core. While the city’s development plans call for mixed use in complex configurations, the end result often seems to be overwhelmed by the economic reality of urban development – money being spent and money being made – and the surprising homogeneity that it produces within those neighbourhoods. Deis’ Last Chance captures a transitional moment within an otherwise non-descript neighbourhood that is undergoing transformation as part of this larger urban development plan. The house is a lone survivor of a previous neighbourhood that was formed in a mixture of residential and commercial uses. Now barricaded by chain-link fence and cautionary signage, the house appears as an anomaly, a throwback to a time before condominiums and densification. The condo tower in the background is evidence of the change that has already overtaken the neighbourhood; and the showroom that abuts the house is intended to provoke panic buying of future condos that will be built nearby. The tree in the foreground comes to stand for the natural world, a space that might once have held a place in any discussion of urban development, but in recent years has simply been replaced by the notion of ‘sustainability’, a rationalized narrative that offers an economically determined model of the natural world. At first glance it may seem that Deis is offering a critique of urban development in which the house is perceived as a righteous fortress, buttressed against any future development on that site. But it strikes me that much of the work that he has done to compose and present this image points to another reading, a reading that is first and foremost a critique of the homogeneity of urbanization, of the rhetoric of densification, and, in this particular instance, of the spectacle of Vancouverism. The tall glass towers, the view corridors to the natural world, the free and easy circulation of capital and commodities, the accumulation of wealth, the revitalization of the downtown core – this is the spectacle that is offered to replace the dreary, balkanized world of old Vancouver. Deis’ decision to compose the picture using a street-level viewpoint, extreme frontality, a uniform sky, and little or no suggestion of depth, ensures that the artifice of his subject is immediately apparent. The reduction of the image to black and white further emphasizes the smoothed homogeneity of the economy that has produced this situation, and also suggests the character of a newspaper photograph, a moment of reportage that is simultaneously a story of heroic resistance and of extraordinary economic opportunityi. And it is within the recognition of this uncanny, dialectical moment that Deis’ project becomes apparent. We must recall that Last Chance is an image that has been placed in the public sphere, on a site that offers a context that is neither an art gallery nor a newspaper, and here it is possible to glimpse the trajectory of the dialectic that Deis has put in place. The scale of the image is perhaps its most notable feature. At 32’ x 43’ it is a formidable size, similar in scale to an oversized billboard or building advertisement. Placed on the blank wall of an otherwise anonymous building it looks a lot like a billboard advertisement for a new condo. An unconventional ad perhaps, but its formality and architectonic composition nonetheless carry those familiar signifiers. Placed as it is in the newly redeveloped CBC/Radio Canada plaza, Deis’ image offers an alternative model of spatiality to this site. His uncanny image fractures the smooth spaces of the site, reinserting a spatiality and heterogeneity, that has otherwise been rendered invisible. Surrounded by cascading lawns, water features, a green-roofed coffee shop and a live-broadcasting, mega-screen tv, the black and white picture offers an enigmatic image, that remind us of the economic, political and ideological forces that produced the current configuration of the plazaii. Deis’ intervention isn’t proffered as a representation of a utopian alternative to the spectacle of Vancouverism, but rather through it we are invited to ask, how can we simultaneously grasp the most dynamic features of urban development and growth while sustaining a viable dialogue and critique? Eric Deis’ Last Chance is a reminder of the critical role of public art in this debate. While preemptive public consultation and critical commentary on key urban developments often provide the public with an opportunity for a close analysis of specific buildings or a regional plan, we are rarely provided with an opportunity to return to those spaces retroactively and see them for what they have become. Public art interventions provide an opportunity to unsettle the smooth spaces of the built environment, to remix and open up its spatiality, to remind us of the necessity of blurring and blending cultures and economies. i. It is worth noting that Deis’ interest is not in reportage or some sort of motivational approach to the specific subject of his photograph. The story of the house is never really told, though it is of interest to note that the long-time owner and resident finally agreed to sell the land shortly after the photograph was taken in 2007.
ii. Of course, it isn’t just the CBC/Radio Canada plaza that reflects this spectacle of Vancouverism, it is present through out the downtown peninsula. The public art site on Hamilton Street was built and sustained through the support of the Vancouver Heritage Foundation and Other Sights for Artists’ Projects. These two groups are dedicated, respectively, to public discourse concerning heritage preservation and to the support of artistic interventions into the public realm.